Molten lava, rocks and gas went flying through the air on Hawaii's Kilauea volcano after an explosion was caused by the partial collapse of a crater wall. The collapse triggered the small explosion, which spread lava and debris around the rim of Kilauea's Halemaumau Crater. This is according to the U.S. Geological Survey's Hawaiian Volcano Observatory. Janet Babb, a geologist with the USGS, compared the blast that happened on May 3 to taking a hammer to the top of a bottle of champagne. "You look at the bottle and you see the liquid, But you don't see the gas," she said. "There's a lot of gas in the lava. And so, when that rock fall hits the lava lake, it's like the moment you knock the top of the champagne bottle off and that gas is released and it hurls molten lava and rock fragments." Rocks overhanging the lava lake are altered by gases coming from the lava, Babb said. The rocks eventually give way. They collapse into the lava, causing an explosion. The material was hurled about 280 feet skyward, she said. No one was injured. Video of the event shows a wall of rocks sliding into a lava lake that had risen to a record-high level. The slide caused an explosion that sent fist-size chunks of rock onto the closed Halemaumau visitor overlook. The area has been closed since 2008. That is when the lava lake formed. There could be fallout of ash and dust from this type of event. But it's very unlikely that anyone could be injured, Babb said. Wind direction dictates the amount of debris that lands in visitor areas. It is relatively common, she said. The last time molten lava was visible in the crater was in 1982. A fissure erupted. The last time there was a lake similar to this one was in 1974. 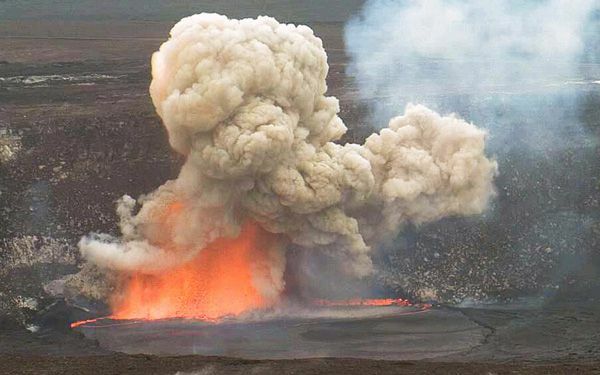 The vent within Halemaumau Crater has been rising and falling since it first opened. It reached a record high last week. Even at its previous highest level in October 2012, the lake was too low for people to see. During the day, people could view the gas rising from the lake. At night, people could see the orange glow from the lava. 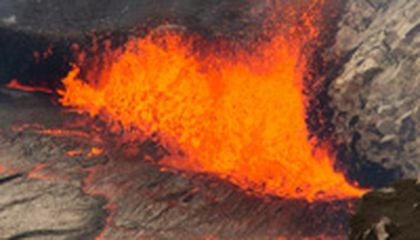 From the early 1800s up until 1924, there was a continuous lake of lava at Kilauea summit within Halemaumau. At that time, the crater was about half the diameter of what it is now. In 1924, there was a huge eruption inside the volcano. That event doubled the size of the crater. Since 1924, lava lakes have been present at different times. In 1967 and 1968, the entire crater was filled with molten lava. You can still see a "bathtub ring" on the walls of the crater. It's where the lava had risen to at that time. Following the May 3 blast, a magnitude 3.6 earthquake was felt in the area early the next day. This was according to the Geological Survey. Critical thinking challenge: What does a bottle of champagne have in common with this volcano? Wow this is an amazing article, before this I didn't even know what lava lakes were! I also find it insane that nobody got injured especially because of how high the lava shot up. I am glad that nobody got hurt in this explosion. How big was the explosion? Did it kill anyone? What made the explosion happen? Does anyone know how it happened or did it just happen out of the blue? I like how the author used details and explained exactly what happened when the volcano exploded.I also think how in 1967 and 1968, the entire crater was filled with molten lava. Just recently, Hawaii's Kilauea Lake exploded due to the collapse of a crater wall. Lava, gas, and rocks were sent in al directions. The massive blast shot about two hundred and eighty feet to the sky, its a miracle that no one got hurt. A video shows rocks falling into tha lava lake, causing the lava to explode. The lava lake, which was formed in 2008, never reached such high levels until this recent explosion. This is fascinating. A lava lake exploded in Kilauea Lake, Hawaii. The blast was said to have been two hundred and eighty feet high and luckily didn't hurt anyone. With this volcano exploding a lot of people will need help like food, water and somewhere they can live until they can get back on to their feet. I can see how Hawaii might be used to situations like this but I still can't believe there were no injuries. It's also hard to believe rocks were thrown 280 skyward. I would have been running for my life. I think it would be cool to witness a lava lake in person. Also, if it exploded and lava went everywhere that would also be cool but dangerous if you are near the explosion. I think it is interesting that people can see the orange glow from the lava. Also I think is interesting is that during the day, people could view the gas rising from the lake. I think that lava is dangerous and scientists should find away to prevent it. Also I'm really glad that no one got hurt. Also I'm really thankful that my uncle had just left Hawaii. This article was amazing because before i read this i did not know that a volcano had gas in it and that know one got hurt is amazing.I also like that they aded some history to the article it gave it a nice touch to the article.